April is National Poetry Month, a time to celebrate poetry and its place in American culture. As we bid farewell to April and head into warmer days, here are some poems to keep you in The Call of the Wild spirit. Canadian poet Robert W. Service has been called “The Bard of the Yukon.” Among his poems are “The Spell of the Yukon,” “The Cremation of Sam McGee,” “The Law of the Yukon,” and even one called “The Call of the Wild“! Although Jack London is more well-known for his novels and short stories, he also wrote poetry such as “The Klondyker’s Dream,” which was inspired by his time in the Yukon during the Klondike Gold Rush. Listen to a dramatic reading of Robert W. Service’s poem “The Spell of the Yukon”! George Guidall, Actor and Audiobook Narrator, Visits Dearborn Today! Go behind the scenes of audiobook production with George Guidall, a superstar of audiobook narration who has recorded over 900 unabridged novels and is the recipient of two Audie Awards for excellence in audiobook narration (the industry’s equivalent of the Oscars). His 40-year acting career includes starring roles on Broadway, an Obie award for best performance Off-Broadway, and frequent television appearances. This year, he will receive a Special Achievement Award from the Audio Publishers Association in honor of his distinguished career. Guidall will present “The Art and Artifice of Audiobook Narration,” offering a glimpse behind the scenes of audiobook production. With signature humor and wit, he will share personal stories, anecdotes and out-takes, describing the subtleties of an art form that speaks to a primal human need for narrative. He will also perform a dramatic reading from Jack London’s The Call of the Wild. This special event is free with no registration necessary. Attend and enter a raffle to win free audiobooks! Synopsis: Jack London’s classic adventure story about the friendship between a Yukon gold hunter and the mixed dog-wolf he rescues from the hands of a man who mistreats him (107 minutes, rated PG). Come watch “Snow Buddies” (2007) as part of our “Let’s Go to the Movies” film series. Synopsis: Adorable golden retriever puppies head to Alaska for a sled dog race and make new friends (87 minutes, rated G). Craft in the children’s area at 1:30 p.m.; film in the auditorium at 2 p.m. Youth Librarian Mr. Jim is in the dog house when the canines take over the puppet show. Librarian Isabella Rowan will moderate a discussion of The Call of the Wild using bilingual copies of the book (Arabic/English). Pick up a free copy of the book at any Dearborn Public Library location. George Guidall has recorded over 900 unabridged novels and is the recipient of two Audie Awards for excellence in audiobook narration (the industry’s equivalent of the Oscars). His 40-year acting career includes starring roles on Broadway, an Obie award for best performance Off-Broadway, and frequent television appearances. Guidall will present “The Art and Artifice of Audiobook Narration,” offering a glimpse behind the scenes of audiobook production. With signature humor and wit, he will share personal stories, anecdotes and out-takes, describing the subtleties of an art form that speaks to a primal human need for narrative. He will also perform a dramatic reading from Jack London’s The Call of the Wild. We sent out a call for animal stories and you answered it! We have over 100 animal tales, which will be published as a book soon. We hope to have an Animal Tales author meet-and-greet at the Wrap-up Party on May 17! Keep checking the website for updates. 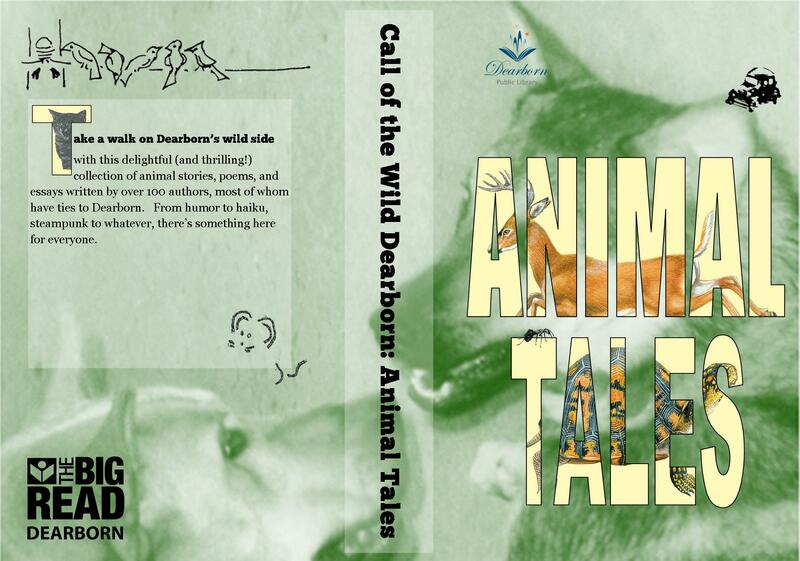 For now, we have a sneak preview of the cover for Animal Tales! The Big Read Dearborn will present a free, special program featuring the man behind the voice, George Guidall, at 1:00 p.m. on Saturday, April 26, 2014, in the auditorium at Henry Ford Centennial Library, 16301 Michigan Avenue, Dearborn. George Guidall has been delighting listeners and relieving long car trips for more than 20 years. As an audiobook narrator, Guidall has narrated and recorded more than 900 unabridged novels including classics like Crime and Punishment and best sellers like Snow Falling on Cedars and Lillian Braun’s “Cat who . . .” series. Guidall is widely recognized in the audiobook industry and has received two Audie Awards (the industry’s equivalent of an Oscar) during his career. This year, he will receive a Special Achievement Award from the Audio Publishers Association in honor of his distinguished career. In addition to being an award-winning audiobook narrator, Guidall also has a long established career as a Broadway actor. During his 40-year career in the theatre that includes many starring roles, he has shared the stage with Kevin Kline, Morgan Freeman, and Meryl Streep. Guidall has received an Obie award for best performance off Broadway. As a special part of his Big Read Dearborn presentation, Guidall will perform a dramatic reading from The Call of the Wild by Jack London. Guidall considers narration an art form that speaks to the primal human need for narrative. During this program, he will also share personal stories, anecdotes and out-takes about narration production. This event is free and open to the public. Attendees will have the opportunity to be entered in a raffle to win a Guidall audiobook. 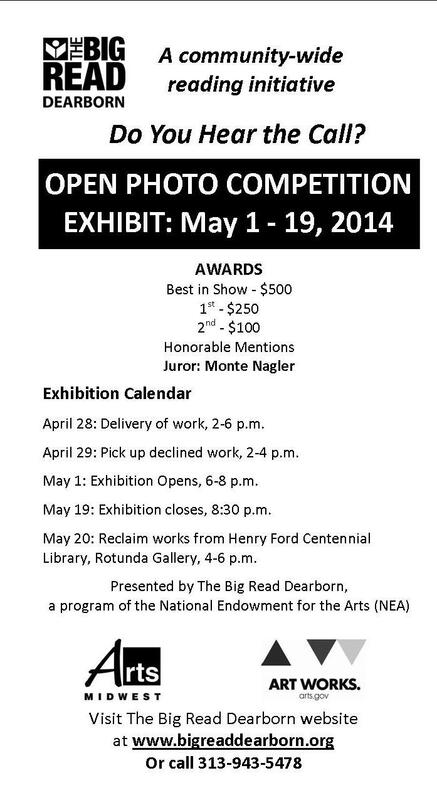 For more information, please call the Dearborn Public Library at 313-943-2330. Calling all youth photographers! Answer the call by submitting a photo of the environment, nature, or wildlife to The Big Read Dearborn’s Youth Photo Exhibition. View the full submission guidelines and enter a photo for a chance to win a gift card prize!